Pacific Beach is a company that makes different flavors of peanut butters. For my review, I was sent three different peanut butters including butterscotch, chocolate and toffee peanut butters. I use peanut butter everyday and think that it is a good source of healthy fats and protein. I use it in my oatmeal usually or on top of a banana or even carrots. This company makes so many different flavored peanut butters so if you are looking for all different flavors of peanut butter, this is a good choice. I tried all of these peanut butters that I was sent and prefered the chocolate peanut butter the best. It is more solid than most other nut butters and the company recommends heating it up before eating. It is a good mix between sweet, salty and crunchy. "Upon my college graduation, I entered a business world with high unemployment, a financial crisis, and an economic recession. After working a number of personally unfulfilling jobs, I decided to start my own business of All Natural Peanut Butter and Flavored Peanut Butter Spreads. When my first peanut grinder arrived, my kitchen became my office and playpen. After locating the perfect peanut (Valencia), I perfected the taste of our All Natural Peanut Butter. Then I tried different combinations of my favorite flavors with my peanut butter." Hey, if you don't like your day job, what is better to have started a peanut butter company? These peanut butters come in 9 ounce jars and retail for $9. 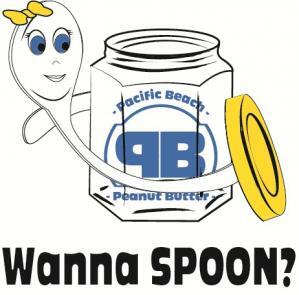 You can get a gift set of the peanut butters for $29 which also comes with an adorable Pacific Beach spoon. 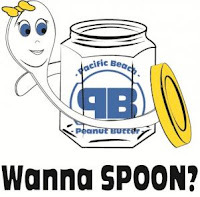 The giveaway will be for a mixed pack of Pacific Beach peanut butter and spoon ($29 value). My husband is a peanut butter nut. He mixes it in a bowl with all kinds of things and eats it. I have learned not to ask. I pack a peanut butter and jelly sandwich every day in my daughters lunch, its her favorite! These all sound delicious. I would like try the butterscotch. Yum! I'd put it on wheat toast or on bananas. I would use it on bread. I would cut pieces of apple & put some peanut butter on each. Its delicious! I like peanut butter on my Cream of Wheat. I'd use it on bread and crackers. I'd use it on toasted bagels and for PBJ's. This would make my hubby's day he puts peanut butter on everything-bagels , oatmeal.. I'd put it on wheat bread with jam! This would get used on Ritz crackers for an after work snack before dinner. I'd use it on toast! Toasted bread, cut up bananas, peanut butter and drizzle honey. Make it a sandwich and call it a yummmmy day!